This cycle, we are focusing on the life skill of belief. We know that belief is the “Yes, I Can” attitude that makes all accomplishment possible. Nobody in history has accomplished anything by believing that they were going to fail. 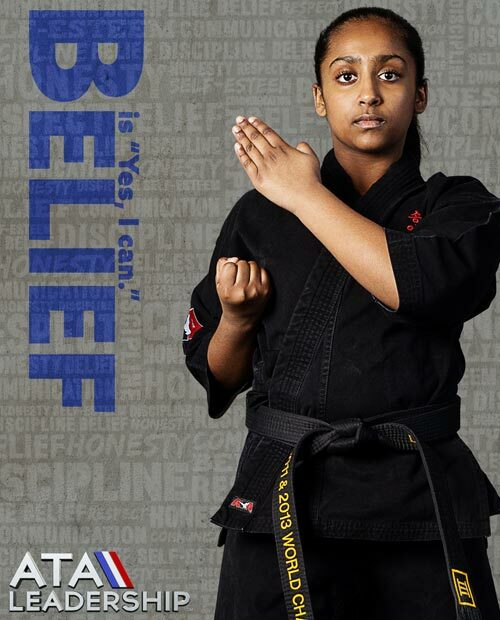 In ATA Martial Arts, we learn to develop a positive self-talk that allows us to reach our goals. The first pillar of belief is trust. Often when we think of trust we think of one person trusting another. That is true, but trust truly begins inside the individual. To accomplish great things, we have to trust ourselves. We have to know that when faced with adversity, we will do the right things and persevere through any trial. We trust ourselves to do the right thing and not the easy thing. When we have trust in ourselves, we can then move on to trusting our support team. In ATA, this means our school. We take great pride as instructors that parents trust their children with us. In today’s society, it means so much when parents trust what the school has to offer. To reach the goal of black belt, students must trust their instructors and the team of students around them. One of the great benefits of martial arts training is learning to build up trust in yourself and trust in others. We may practice an individual sport, but it takes a whole family to grow and develop.